Rome has asked us if we have the intention of proclaiming our rupture with the Vatican on the occasion of the Congress of Assisi. We think that the question should rather be the following: Do you believe and do you have the intention of proclaiming that the Congress of Assisi consummates the rupture of the Roman authorities with the Catholic Church? For this is the question which preoccupies those who still remain Catholic. Indeed, it is clear that since the Second Vatican Council, the Pope and the Bishops are making more and more of a clear departure from their predecessors. Everything that had been put into place by the Church in past centuries to defend the Faith, and everything that was done by the missionaries to spread it, even to the point of martyrdom, henceforth is considered to be a fault which the Church must confess and ask pardon for. Hence the complete about-face of Rome, since the Second Vatican Council, which makes us repeat the words of Our Lord to those who came to arrest Him: “This is your hour and the power of darkness” (Luke XXII, 52-53). Adopting the liberal religion of Protestantism and of the Revolution, the naturalistic principles of J.J. Rousseau, the atheistic liberties of the Declaration of the Rights of Man, the principle of human dignity no longer having any relation with truth and moral dignity, the Roman authorities turn their backs on their predecessors and break with the Catholic Church, and they put themselves at the service of the destroyers of Christianity and of the universal Kingdom of Our Lord Jesus Christ. The present acts of John Paul II and the national episcopates illustrates, year by year, this radical change in the conception of the Faith, the Church, the priesthood, the world, and salvation by grace. 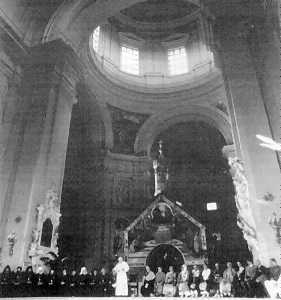 The high point of this rupture with the previous Magisterium of the Church took place at Assisi, after the visit to the synagogue. The public sin against the one, true God, against the Incarnate Word, and His Church, makes us shudder with horror. John Paul II encourages the false religions to pray to their false gods—an immeasurable, unprecedented scandal. We might recall here our Declaration of November 21, 1974, which remains more relevant than ever. For us, remaining indefectibly attached to the Catholic and Roman Church of all times, we are obliged to take note that this Modernist and liberal religion of modern and conciliar Rome is always distancing itself more and more from us, who profess the Catholic Faith of the eleven Popes who condemned this false religion. 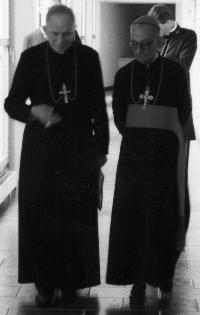 The rupture does not come from us, but from Paul VI and John Paul II who break with their predecessors. This denial of the whole past of the Church by these two Popes and the bishops who imitate them is an inconceivable impiety for those who remain Catholic in fidelity to twenty centuries of the same Faith. Thus we consider as null everything inspired by this spirit of denial of the past: all the post-conciliar reforms, and all the acts of Rome accomplished in this impiety. We count on the grace of God and the support of the Virgin Most Faithful, all the martyrs, all the Popes right up to the Council, and all the holy Founders and Foundresses of contemplative and missionary orders, to come to our aid in the renewal of the Church through an integral fidelity to Tradition.